50 Days Of Logos? All We Can Take Is 1 Day Of Logos. Well, power to the people, I guess. Yesterday we announced quite innocently that we’d be changing our logo every day for 50 days to salute a different startup. 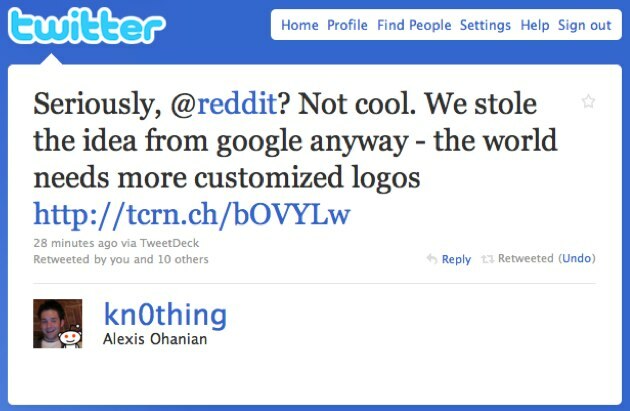 We thought it would be fun based on doing it last week with an old Twitter logo. Fun it was not. Reddit, it seems, has been doing exactly the same thing for the last eight days. Within moments of our post going up we were slammed for copying them. And then demands were made that we stop, and/or give them credit for inventing the silly idea. I scoffed, and then things went crazy. We get more than our fair share of crazies in our comments, but this was over the top even in our experience. We banned dozens of hateful comments, but they’re coming faster than we can stop them. And I certainly have no intention of doing this day after day as each new logo goes up. So, Reddit, you win. Making fake logos is your territory from here on out. Some things just aren’t worth fighting about. And believe me, if we actually ever visited Reddit and saw that they had begun doing this we never would have done this, too. Hope everyone enjoyed our 1 day of logos.